Bowser’s back with another dastardly scheme in Mario’s latest adventure – the moustachioed icon rushing to save Princess Peach from the Koopa leader’s clutches, when he learns that his archenemy plans to marry her in a lavish, no-expense-spared royal wedding. But, when his rescue attempt goes wrong, Mario is thrown from Bowser’s Airship and helplessly tumbles into the Cap Kingdom – his trademark red cap becoming torn up in the process. Waking to find Cappy innocently poking him, Mario startles his new companion who, after running after him, explains that the Bowser has kidnapped his little sister Tiara, too. With all of the airships in the Cap Kingdom wrecked in the attack, Cappy remembers that there may be one in the neighbouring kingdom. And, with a whole world to explore before them, together, this unlikely pair of heroes set out to chase down Bowser and stop him getting hitched. Mario may be pushing 30 but he still has his signature moves – whether that be the Long Jump, Ground Pound, Triple Jump, or Side Somersault – but it is Cappy, with his little tuft of blue hair, that helps to make the portly hero feel more energised and versatile than he has ever been before. Mario can throw Cappy upward, downward, in a spin around him, or home in on nearby enemies, but it is the sprightly Cap Jump that allows for greater freedom in extending how far you can leap with Cappy becoming a trampoline for Mario to bounce on. Throwing Cappy mid-air and then diving on to him soon becomes the quickest way to get around, letting the player take shortcuts and can also save you from hearing Mario wail into oblivion. And, then there’s Capture. With traditional power-ups such as the Fire Flower and Tanooki Suit nowhere to be found in the kingdoms that you explore, Mario is left to use Cappy to capture enemies to harness their abilities. After you hear Charles Martinet playfully ‘ribbit’ when Mario first becomes a frog, Nintendo wastes no time in letting you stomp around as the T-Rex and you will soon be flapping around in the skies as a Paragoomba, busting rocks with a Chain Chomp, swimming around as a Lava Bubble, or hurling frying pans as a Hammer Bro. There are more unexpected surprises, too, but I wouldn’t want to ruin them. While you are free to play with button input or motion control, there are gestures that can see you jump even higher as a frog, fly faster as a Paragoomba, or throw frying pans even faster. Sometimes there is an alternative button input, but, what I’m really trying to get at, is that Super Mario Odyssey is a game best played with the Joy-Con. That lends itself to the two-player co-op mode, too. This requires some coordination, but, with a Joy-Con controller each, will let you team up with family and friends where one player controls Mario while the other looks after Cappy. Games can often become even more enjoyable when players with others, and this will certainly be helpful for parents who want to lend a hand to younger players. Speaking of that, Nintendo has also thrown in an Assist Mode. When selected, this will provide players with extra hearts, rescue them in a bubble whenever they fall down somewhere dangerous, restores their health when they stand still, and arrows can point them in the right direction. I’d argue that this overly simplifies the experience, but, again, it’s not really targeted at me. It is in its breadth that Super Mario Odyssey frequently astounds, and while not every kingdom has been built to the same scale each is ingeniously crafted and has secrets tucked away in every corner. It’s clear that Nintendo has relished the return to open-world sandbox, with each kingdom feeling unquestionably distinct from one another – accompanied with their own handy brochure that not only acts as the map but lists tourist hotspots that help the whole globe-trotting adventure to come alive. The many ways that Nintendo has hidden the Power Moons in each kingdom that you visit makes this Nintendo Switch exclusive such a revelation. Whether sprouting flowers, whacking a bird that’s flying around, or rushing to complete a Timer Challenge, Power Moons are stuffed everywhere – with the kingdom simply becoming a playground of discovery. There are even minigames to distract you such as Trace-Walking, where the player must trace the outline of a shape on the ground as it disappears, the Jump-Rope Challenge, and Picture Match, where you have to put a character’s face – like Mario or an angry Goomba – back together from memory. Fun diversions, but it’s the constant surprise that means that Super Mario Odyssey never stops coming up with different ways to make you smile. Many have an online Rankings Board for you to compete with friends and players from around the world, even if some of the early records already seem unbeatable! Even after the 652 Power Moons that I have collected so far, it still feels like I have barely scratched the surface with Super Mario Odyssey. I can see that there are warp holes left to discover, Hint Art puzzles to decipher, Koopa Freerunning races to clinch a victory in, and regional coins to hunt down to buy more souvenirs and stickers at Crazy Cap, but as you cross more off the list it’s often a challenge to work out where the rest of them remain cunningly hidden. That’s not to say that the game is absolutely crammed with them from the start, and, carefully treading around spoiling anything, only a limited number can be found until you see the story through to its dramatic showdown. But, be safe in the knowledge that stopping the royal wedding is just the start, and that there is plenty left to discover once Bowser’s plan is foiled. Fear not. amiibo support can help you sniff out the more obscure Power Moons, Uncle amiibo letting you scan three amiibo who, after scurrying around the kingdom for five minutes, will return with a hint on where to find them. It still requires some deduction, but this will help in the especially generous postgame. As you probably know, the wedding outfit Mario, Peach and Bowser amiibo will reward you with special costumes, as well as temporary invincibility, a Life-Up Heart, and pointing out regional coin locations, respectively. The costumes can be unlocked through normal gameplay, so you certainly shouldn’t feel like you are being forced to buy them. Sure, unending curiosity will spur your exploration in Super Mario Odyssey, but the constant and playful surprise is what makes it such a joy to behold. Walking around the Metro Kingdom I saw a crowd queuing outside a theater waiting to see “one of the all-time greats,” only to wander in and discover that you can leap your way through World 1-1 in Super Mario Bros. on a cinema screen as the audience cheers you on. I have also passed a radio that was randomly blaring out the Japanese version of the jazz-fuelled “Jump Up, Super Star!” theme song, and, of course, there are the many random places that you bump into Captain Toad. This also makes Snapshot Mode is a perfect addition. It’s sure to make you feel like a tourist, but hitting down on the control pad will freeze whatever’s happening on-screen for you to freely move and rotate the camera to line up that perfect holiday snap. The filters will surely result in some artistic shots and slapping the game’s logo seems unnecessary, but I’m looking forward to seeing what everyone starts to share online. Super Mario Odyssey isn’t free from criticism, however. The boss battles, which arguably rank among Nintendo’s craziest best, are recycled a little too often, and the draw distance suffers in busier kingdoms to risk removing you from swooning over the game’s otherwise dazzling spectacle. 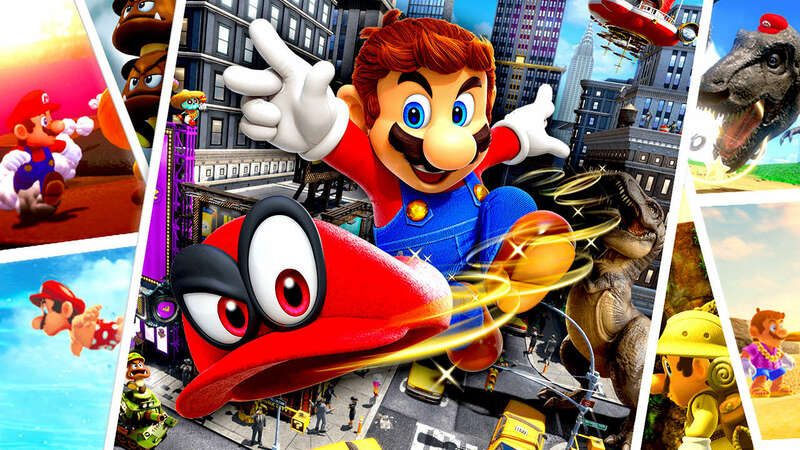 But, there is no other series that can capture pure joy so readily, and, coupled with the fact that Nintendo has regained their confidence with Nintendo Switch, sees Super Mario Odyssey never hit a bum note. Packed with energy, charm, and every trick in the book thrown in, choosing to hop aboard the Odyssey will undoubtedly result in you having the chance to experience one of Mario’s greatest adventures. It’s a perfect reminder of the gaming magic that Nintendo is revered for, and something that they have miraculously been able to bottle twice within a single year.